The MG Maestro Turbo was a high performance reaction to the growing band of 16 valve hot hatch cars of the post 1986 period. In fact, a Maestro Turbo was part of the production plan back in 1984, but the development cars were said to be ‘too fast’ and only the Montego Turbo appeared during that period. Events though, saw the model resurface, this time though with a beneficial and very individual body kit. 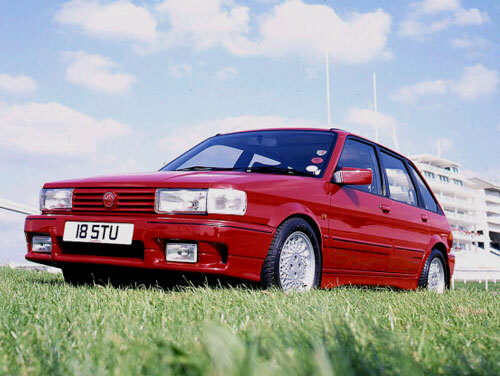 The Maestro Turbo was first shown in a low key way at the Birmingham Motor Show in October 1988 to a surprised MG world. Essentially the car was a standard MG Maestro into which the Montego Turbo drivetrain and suspension was fitted, to create the fastest production MG to date. Whilst the ingredients were simple off the shelf items the mixing was finalised by Tickfords which also included them developing and manufacturing a one off 5 piece body kit, the heart of which was very bold front and rear bumpers. The front carried integral Lucas driving lamps and rather large side ‘TURBO’ graphics. Cars were assembled with other Maestros at Rover’s Cowley facility before being shipped to Tickfords Bedworth plant for application of the bodykit and graphics. They were then returned to Rover before being despatched to dealers. 500 were commissioned, although Tickfords records indicate 505 (including the 1988 Motorshow car) passed through their facility. This was made up of 215 red, 149 green, 92 white and 49 black cars. Although regarded early on as a future classic there are probably less than half still in existence.